Large volumes of lubricating oil are required to cool and protect the internal surfaces of engines. These conditions result in the generation of oil mist, which traditionally was vented to atmosphere. However, this may now not meet increasingly stringent environmental legislation. Failure to deal with oil mist can at worst represent a significant environmental hazard and at best will attract dust and dirt making the site an unpleasant place to work. Our oil mist eliminator systems have been designed to remove all visible oil mist. Our fan assisted oil mist eliminators compensate for the differential pressure across the oil mist eliminator cartridge and can create a small depression within the machine if required. 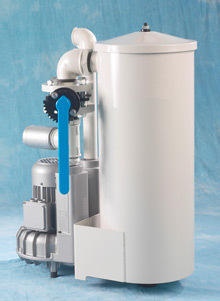 This eliminates unwanted pressurisation of the lubricating oil system itself. Fan assisted units are typically utilised for diesel / gas engine crankcase breather applications. Our naturally vented oil mist eliminators are suitable for retrofit applications where fan assistance is already provided, or more unusually, where machines can operate with a positive back pressure. Click here to download a PDF for further information.